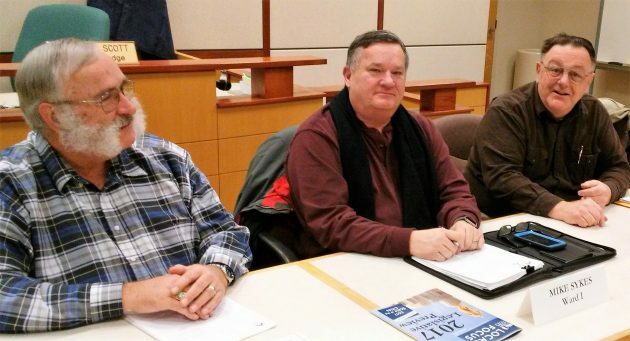 Councilman Mike Sykes, flanked by Ray Kopczynski, left, and Rich Kellum, at a council work session on Jan. 9. Albany Councilman Mike Sykes wants the council to revisit the idea of weekly rather than biweekly yard debris pickup, which it turned down last October. And he’ll get his wish. Sykes was elected last November and has been on the council since January. At a work session Monday, he brought up the yard debris issue and asked the council to take another look at it. As a result, Mayor Sharon Konopa says, the city staff will contact Republic Services to bring the question back to the council, probably within a month. Republic picks up yard debris from its Albany customers every other week as part of its regular trash disposal and recycling service. 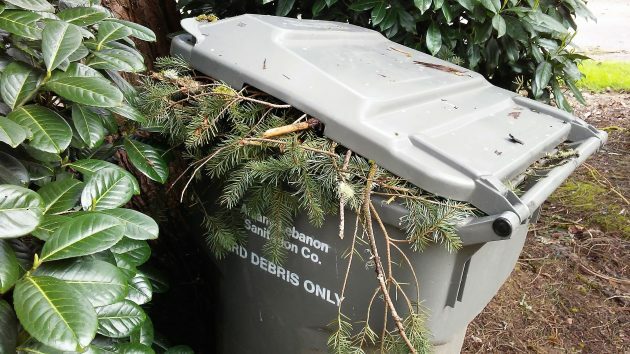 Elsewhere — in Lebanon and Corvallis, for example — the yard debris pickup is done weekly, which allows customers to put their food waste in with the yard debris. Republic turns food waste and yard debris into compost at its facility on Camp Adair Road. Last year the company proposed that Albany, too, authorize weekly yard debris pickup along with a $3-a-month increase in the price of its service. Republic had conducted an email survey among its Albany customers and said a majority of those who took part favored yard debris service every week. But Councilman Rich Kellum noted that the number in favor amounted to only about 3.5 percent of all the customers. When the issue came to a vote in October, Kellum and four other council members decided against weekly service and the rate increase. Only Councilman Ray Kopczynski voted in favor. On Monday, nobody objected when Sykes suggested that the council take another look. But Kellum and Councilman Bill Coburn said that while people may want the weekly service, they don’t want to pay extra for it. One reason more frequent yard debris service would be useful. I agree that we need weekly service during summer months. I would be willing to pay more to get that service. I agree with Tammy. Extra pickups in the winter would be superfluous but appreciated in the summer. I could really use weekly service and would be willing to pay for it. Yes please! That bin gets too full too quick and does not get emptied soon enough for 9 months out of the year. I don’t need and would not be willing to pay more for weekly service. I compost my own except for larger woody material and feed my kitchen waste to my worms. I generate about two cubic yards of nice compost and another twenty gallons of worm castings on an annual basis. Why does Sykes want this? And why did you feel it important to have this line twice in this posting? Please ask Sykes why he wants us all to pay more. Or maybe Sykes can answer right here, right now in the comment section. As to my first why, it seems the majority is all for it and willing to pay the additional cost. That is after a quick glance of the comments. We’ll see if the same goes for providing facilities and educational opportunities for the youth. a.k.a The children of our community. The reason it failed is that the majority did not say they wanted it, Republic said 500 wanted it but that is 3.78 % of the total, what are you willing to pay for that only 4% of people say that they want???? Isn’t the real reason “it” failed was because the council majority voted it down?! I agree we need weekly service for the yard debris. Not just for the summer months but for all year. And I would not mind paying a little extra for it. NO to weekly service on the recycling. We pay enough already and it is easy to share containers with neighbors if you need more on a certain week or just feed it in for a couple of times. We are getting too many increases, ie water, sewer, rain tax!!!!!! This would be an excellent way to divert food waste from the landfill to compost. Well worth the extra $3 monthly fee! I have no problem paying $3 extra a month for every week pick up.it would be fantastic! One can every other week works for me. Keeps me from working too hard in the yard. I am against this, as I was the first time around. We would definitely not use it. I don’t want to pay for it. As a household of 5, my home certainly creates lots of waste that could be diverted away from the landfill. Think on this: Neighbors in Corvallis and even little Philomath are able to toss pizza boxes (food oil soaked cardboard can’t be recycled, but it’s good compost) in their organic yard bin. Given Albany’s size and number of pizza shops, that adjustment locally alone could divert tons of waste away from the landfill. Organics buried in a landfill will never breakdown without heat and air… tonight’s local $5 pizza boxes (I assume it’s a couple hundred pizzas daily) will take up real-estate forever! I read the council notes from last vote and I agree with one counselor that local folks won’t fill a 90 gallon bin with orange peels and egg shells on a weekly basis… but I’d implore our elected leaders to open their minds in regards to waste stream management and challenge republic services to provide some better options locally than all or nothing. Given no other options, I voted online for and I’m open to spend $3 a month more to open the possibility of better waste stream management, AND enjoy somewhere to put all the extra springtime and summertime yard waste as well as 60+ pizza boxes annually. ( I can’t be the only albany resident who’s got wind-storm debris piled high in the grey bin and piled up waiting for another couple weeks for its turn in the bin or heading to landfill). Due to the biweekly pickup we have had two yard debris containers for about three years. And we still overflow especially in the spring and fall. Going to a weekly pickup for a mere $3. We’re on board and will still probably fill both cans. I have been wanting this for several years. You would be surprised at how much even one person could generate on a weekly basis that could be composted. I am completely in favor for a weekly pickup. A rate hike of only $3 per month is less than one coffee at my favorite coffee kiosk. to pick up our pre composting material more often? rain going down the storm drain. I *wouldn’t* be willing to pay extra. Isn’t it a bit odd that just about all the people that claim to be for the proposal have NEVER posted on Hasso’s blog before? PAY FOR a 2nd yard cart and leave the rest of us alone!